Being a pianist is not an easy job. Being a professional pianist who’s always trying to conquer new peaks is even harder. Many hours of practice per day, lots of stress, many powerful emotions – positive and negative, many intellectual challenges… and the list can go on! The lifestyle of a good musician doesn’t involve only playing beautiful music on prestigious stages. In order to achieve that, you have to pass through thorns and blood, through extreme fatigue and exasperation, through hope, faith and even superstition. But the most difficult challenge a pianist is forced to face is the daily practice routine. Of course, practice makes perfect. It’s impossible to become a true piano master without hard work. But most piano students are so obsessed with their practice that they forget to compensate somehow the static lifestyle of a musician. Here is the classical picture of the side-effects a perseverant pianist is experiencing because of his/her unilateral activity: back pain and spinal column deformation, headaches as a result of the intracranial hypertension, poor eyesight (in most cases myopia), weak muscular tonus, low levels of energy, increasing frequency of negative thoughts, insecurity, separation from the outside world… Does all this sound familiar? There are so many talented pianists who consider quitting their musical career because they can’t cope with all these negative moments! Is there a way to prevent and fight with all the downsides of an intense piano practice? Fortunately, there are hundreds of ways of protecting your health and at the same time practice piano many hours per day. Here I’ll analyze just a few of them. The basic principle is simple: piano playing is a static activity. Even if your arms and fingers are moving, the rest of your body is motionless. Some people say that piano playing is a good exercise for one’s arms and fingers. In my future posts – about the relaxed playing – I will prove that this is not entirely true and, most important – it’s absolutely not enough for keeping your hands, your elbows, your forearms, your wrists and fingers in good shape. This may sound like a paradox, but it is still true: in order to be a good pianist, you have to use many other different methods to strengthen your pianistic skills and to balance your mind, not just endless piano practice. First, learn how to breathe. This is not a joke. When was the last time you paid attention to your breathing? In my future articles I will show you the direct fundamental connection between breathing and music. Now I will just say that every musician should practice deep breathing exercises every day. It will oxygenate your body and your brain, will improve your mood and will balance and calm your mind. I can say the same to a pianist. Motion is life. How can somebody understand music – this superb reflection of the universal harmony – if he/she cannot understand his/her own body? Walk or run at a slow pace at least one hour per day. The best results are achieved outside, where you have the possibility of breathing fresh air, thus oxygenating your whole body. If you don’t have the option to exercise outside, go to a gym! Just do something every day, this is the most important thing! Jogging (or fast walking for beginners) also helps eliminating the toxins from your internal organs and improves the blood circulation. After a period of constant exercises, you’ll notice that your ‘cold hands syndrome’ vanished somehow! Then move on to something more complex. I recommend yoga. This ancient healing system is a wonderful way of balancing your mind with your body and yourself with the rest of the world. You’ll learn how to control your breathing, your muscles, your joints and, most important – your mind and your emotions. This is crucial for any performing pianist! Yoga can also help you get rid of back pain by stretching and strengthening your spine. Martial arts are also extremely effective for strengthening your body, your mind, the power of your will and your courage to make decisions. Aikido, jiu-jitsu, taekwondo, kung fu or karate will bring your understanding of the biological energy to a new level, increasing your resistance, your fluidity, your discipline, your self-confidence and your ability to deal with complicated challenges. Other physical activities (aerobics, team sports) are very good as well. Everything is better than nothing! However, I strongly recommend practicing something that will train not only your body, but also your mind and your positive attitude. That’s why deep breathing, meditation, yoga and martial arts are my top recommendations that will help you compensate those long hours of piano practice. And the most important thing: if you love music, especially piano music and you’re considering building a professional piano career, you’re making a good decision. BUT! Let’s not forget that the ultimate goal in this life is to find your balance and your happiness, to fully awaken your unique potential, to bring you and your loved ones light and a sense of purpose. Music and piano playing is just a means to that end, just a way to reflect the beauty of this universe, not the goal itself! So avoid the trap of a unilateral life and learn to enjoy the complexity of this wonderful world! Smile! Breathe! Play! Be stronger! Be happier! thank you for sharing, everything you said is very helpful for my practice especially I learn to play the piano myself. I hope I can learn more from you. I hope that my other articles and video tutorials will be helpful for you as well (you can go to Archives to have access to all the posts available here on this site). 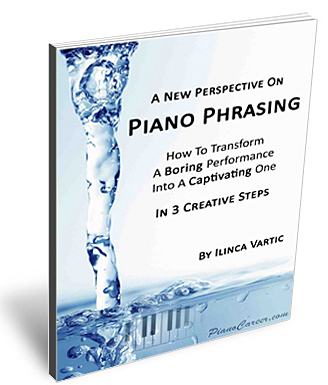 Also, in the beginning of 2012 I launched an exclusive Piano Coaching Program at PianoCareerAcademy.com. On the Private Members Forum I share the unique secrets of the Russian piano school, also giving detailed, personalized, professional answers to each piano question! Thanks a lot Ilinca. Yesterday was the first time I encountered your web and I did read several articles you wrote. I really admire you and very thankful for sharing because those articles are helpful such as right posture and this one. Your words really encourages me a lot such as good and positive attitude. This summer I am going to work on Schubert Sonata A major and Bach English suite G minor. Here no one believes that I did not learn anything when I was a little girl. Let me share something with you. When I was a little girl I hear the sound of piano at the church. I saw people play the piano and I memorize the melody. Then I saw how people put their fingers on keyboard. This is how I learn to play the piano. Next, I imitate those who play at the church and put the same music book in front of me on the same page. I match the finger , the keyboard to the music note, this is now I learn to read music note. I longed for to have a piano teacher but did not have a chance to have one. Times flies. I am not a little girl any more. I still have passion in music but I don’t have much time to practice because I have to work now. My job is teaching foreign language at a high school. This is summer time and I can be relaxed a little bit. Playing the piano is a way I take care of myself. Again, thank you for sharing. It’s never too late to improve your playing skills – and I’m sure that you’ll do great! Good luck in learning Schubert and Bach – these pieces are very beautiful! Enjoy your summer vacation and your practice!!! And that 4 hours would have to be split-up over a day; you just can’t go 4 hours non-stop without having some type of fatigue or loss of concentration. A 30 minute stint with 110% focus, done 3 or 4 times a day is way more efficient than 4+ hours. This is the purpose of my article above – pointing out that we need to compensate our static practice routine with physical exercise and other things that we enjoy! When I was studying (I graduated a professional musical lyceum, then a Conservatoire and then I got my Masters degree in piano performance), we had to practice more than 4 hours per day very often – it was the only way to cope with the extremely challenging requirements of our exams. We used to practice 1-2 hours at a time – then a short break and then another 1-2 hours. Or, even better – a couple of hours in the morning and a couple of hours in the evening. Of course, quality is always more important than quantity! 😉 But quality + quantity, combined in a smart, focused, mindful manner = outstanding results!!! I cannot restrain my self to follow this to make my life beautiful…. I’ve been around your website before and I find your work amazing and inspiring. I wish all pianists thought that way, and revaluated the concept of piano playing and what’s really important about it. I have something I would like to share with you. I love the piano, and I have been playing the piano for about 16 years (I am 23 years old). I’m happy to say I got my degree recently. :)… However, I am also an interpretation student, which requires me to study many hours a day in order to develop my skills as an interpreter. The program is getting tighter day by day and I’m finding it harder to keep up with my piano practice. My interpretation tutor tells me that i have to choose betwen the two (piano-interpretation) because both require a whole lot of dedication. However I cant bring myself to do that. 🙁 I love the piano so much, but I can’t depend on it for a future job the way things have become lately. I also love interpretation and the thrill of learning new things everyday. Do you think it’s possible to make an effective program so that I can keep up with my piano practice, without overdoing it? Is 2 hours at least enough? This is such a complex question! 🙂 Piano playing (on a professional level) is indeed a lifetime commitment, and it requires a lot of time and dedication. Combining it with another full-time activity is extremely difficult – not impossible, but not easy either. Yes, it’s possible to maintain VERY decent playing skills if you practice only 2 hours per day – but the most important thing remains the quality of your practice, not its quantity. Plus, as you surely realize, your schedule will be very tight and you WILL need to make sacrifices – so in the end, it all depends on you and the choices you make :). … and also the hundreds of videos and articles that you can find in the Members Area of my Piano Coaching Program at PianoCareerAcademy.com. I am an old man now, and I’ve fooled with playing jazz on the piano throughout my life. When I found your website, I was impressed. I realized I never listened to any of advise I received a a child in regard to technique (posture, position of hands, relaxation, etc., and scales were just to boring). I wanted just to learn something and play. My playing was so sloppy, and I almost never even learned entire piece. Somewhat I managed to enjoy this sloppy playing, maybe with applying some rhythmical structure that I was sort of natural with. Then, late in my life, I took just 3 lessons with a wonderful teacher (he was the age of my daughter), now a famous jazz pianist, and I couldn’t believe the results. After practicing simple stuff he taught me (mostly the harmonic approach to jazz standards, but not what I had ever read in any book, not presented that way). I could, for instance, play several choruses of some standard with the intro and with a control I had never knew. Nothing really for a stage, but for me it was just beyond belief. I MADE MUSIC. Now I’ve seen your advice (it is a bit different – not about structure of improvisation, and more focused on body/mind connection to playing piano), and I’m just as stunned. Just after few hours my fingers started to have run so much better. I could play a few octaves of C and all the tones were nice – no glitches, no missed tones, or jarred tempo. I really love what you do. I don’t plan to become any near to a professional performer, just to fool with music a little better, MAKING MUSIC possibly for someone else, like friends, maybe playing for free in a restaurant or hall. But even that, I know require a quite serious a commitment. And I think, that no matter how little of that commitment I can afford, as long as it is real, heartfelt, and strives for excellency, your advice could be gold. Unfortunately I don’t feel like I want to buy any of the deals – all I want is some specific advice, here and there. Anyway. You are just so good at what you do, inspiring, clear, professional, fun, warm – congratulations! Keep the spirit, keep practicing correctly, with love and dedication – and enjoy the journey!